On day two of our last Disney Trip we headed over to the most Magical place on Earth. 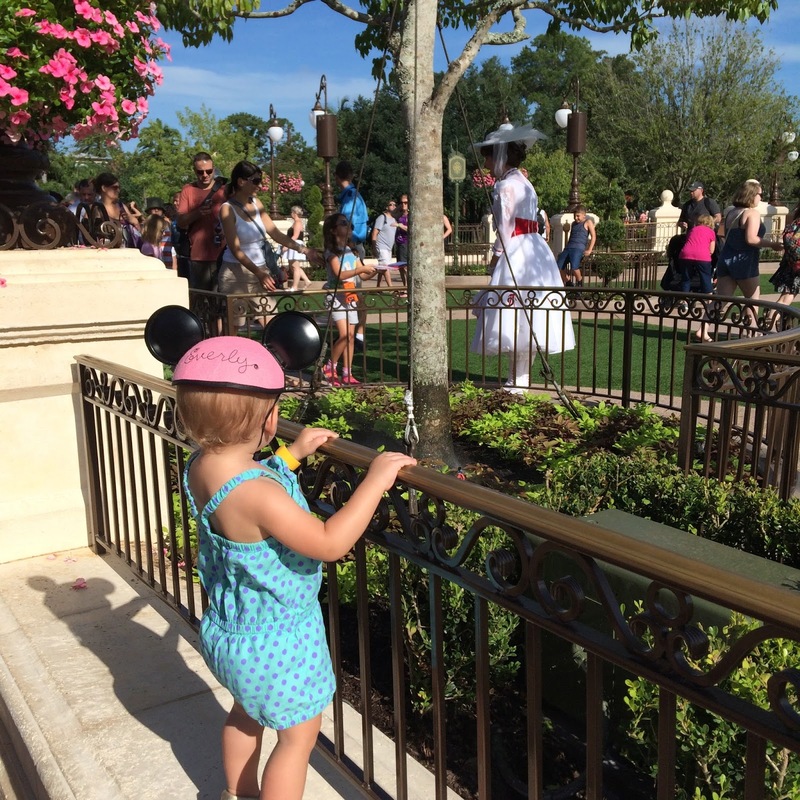 If you want to read more about our first day go HERE.Magic Kingdom is a park I really feel you need to plan to get the most out of it. Since we go to the parks a lot we knew what rides we were willing to miss out on and what rides we wanted to focus on. 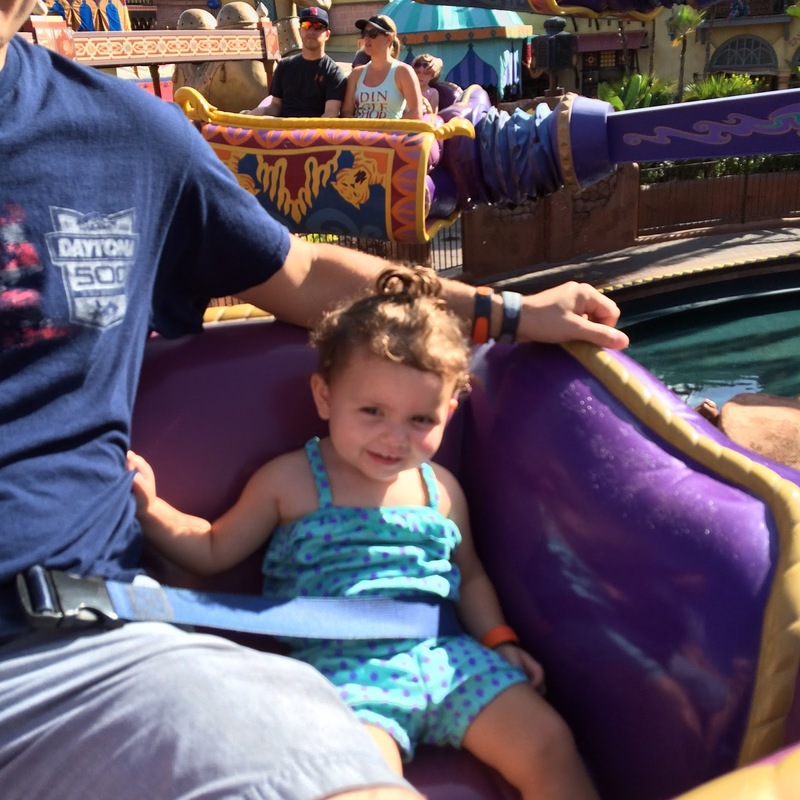 My kids had never been on Jungle Cruise so I wanted to make sure we got on that one. We originally got Fast Passes for Jungle Cruise, Enchanted Tales with Belle and Barnstormer (Me) and Thunder Mountain (Branden). My plan was to go over to Adventure Land first and ride Aladdin’s Magic Carpet ride then use our Fast Pass on Jungle Cruise. When we got there both rides were empty so I moved out Jungle Cruise Fast Pass to Winnie the Pooh a little later on. We rode both of those then headed over to the Haunted Mansion. It was about a 15 minute wait and moved pretty quickly. We then headed over to It’s a Small World and that is another ride I haven’t appreciated in a long time. It’s a ride I loved as a child but obviously grew out of and now that I have children who love it I have to make sure we get on it. It’s also never a long wait. We walked right on. We then went over to Mickey’s PhilharMagic which is a really cute 3D show. My kids love this one. Also, it’s a good place to take a break from the heat. We got lucky and walked up right when they were letting people into the theater. The timing couldn’t have been more perfect. We had lunch at 11:15am. We wanted to get in early before the crowds. I can not tell you how much nicer this is. When lunch time hits the lines and crowds just become too much. Everyone (mainly kids) are cranky and hot and it’s just no fun. Our kids were all in awesome moods so we figured lets do this now! We had brought lunch for the kids and Bran and I ordered a caesar salad, pizza and then Branden also got sides and a drink for Ace. It was probably one of the cheapest meals we ever had at Disney, ha! I highly suggest bringing your own food in if you can for even some of what you eat throughout he day. Not having to wait in lines for snacks or even food for your kids is so nice. We were able to get them seated and fed right away. After lunch we headed over to Winnie the Pooh to use our Fast Passes. 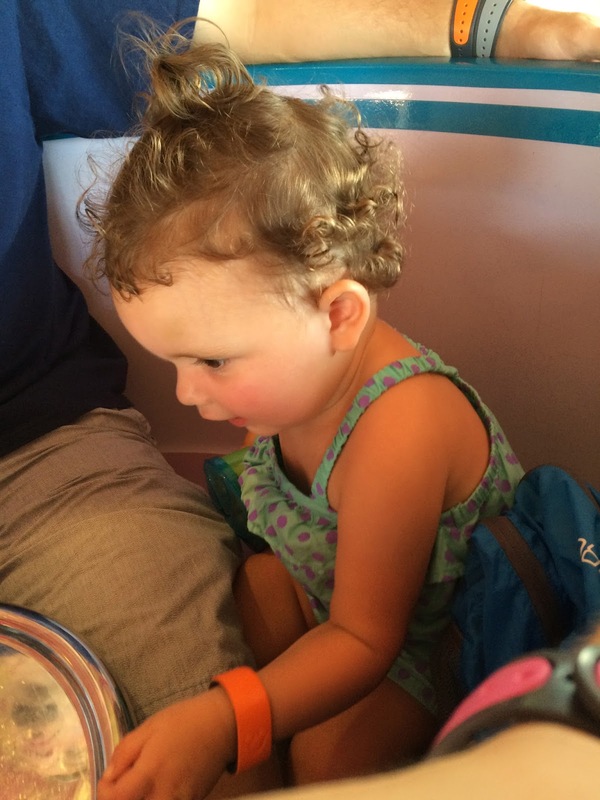 We also picked up a Baby Swap at Mine Train for later. If you have babies, use the Baby Swap! We then did the teacups, which is one of my favorites. It’s never a long wait and all the kids love it. Our Fast Passes for Enchanted Tales with Belle wasn’t for another hour but we wanted to leave that area so we decided to swap out that Fast Pass for Buzz Lightyear for when we came back at night. 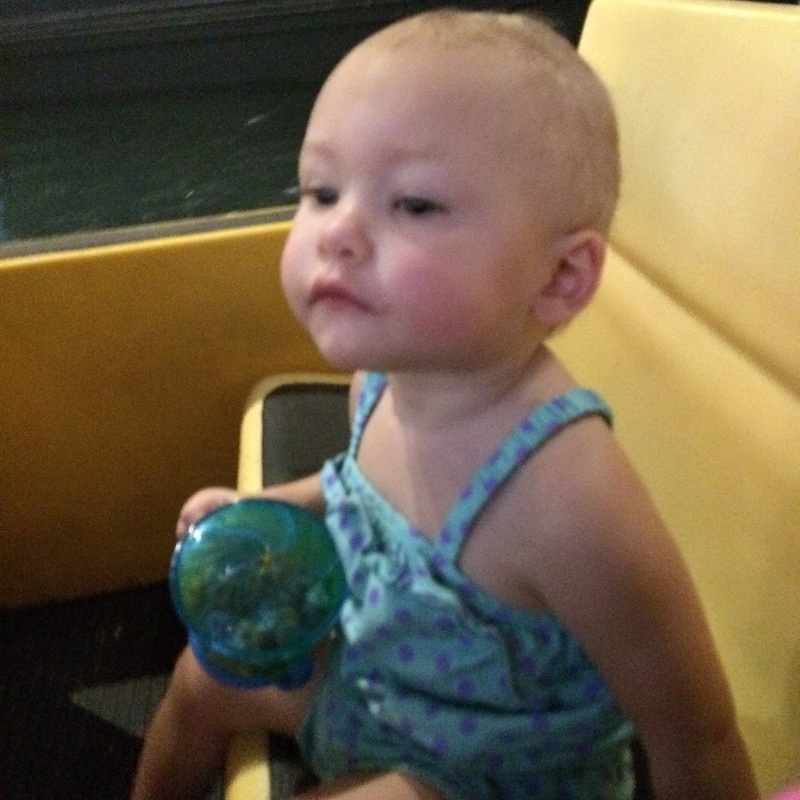 After that we headed over to Barnstormer, got a Baby Swap for later and let Ace play at the Casey Jr. Splash N’ Soak Station. We had a total parent fail and didn’t bring bathing suits like I originally wanted to. We then went to the Train and took it to the front of the park so we could leave and have a break for naps. We originally had a plan for the night to get on the train and head over to Thunder Mountain. 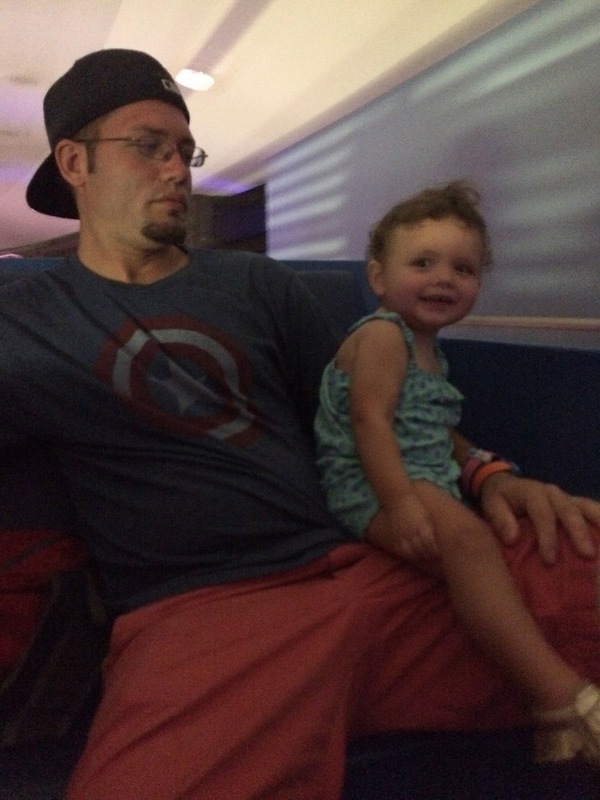 We decided against that since the babies would have to be waiting around in the stroller so we switched out that Fast Pass for Tomorrow Land Speedway. Ace loves this ride and Branden likes taking him on it so I figured that would be a good one for just the two of them to ride. It’s also a fun one to ride in the dark.When we got back to the park we headed over to Barnstormer to use our Fast Pass and Baby Swap so Branden and I could each ride with Ace. It was really hot at this point and looked like it might rain so we then headed over to Dumbo, another family favorite. The wait was about 30 minutes but they have the play area inside and we used the option to go in there and wait for the line to go down a bit. We actually ended up letting the kids play for probably a half hour or so because they were having so much fun and it was so cool in there. We also worried about the rain so we took full advantage of that play area. The Speedway Fast Passes were coming up so we finally hopped in line and waited maybe 10 minutes and it was nice and dark out by this point. I love riding Dumbo when it’s dark. Branden said Everly got nervous on this one. I rode with Ashlyn and Ace and they always love it. Bran and Ace used their Fast Passes on Speedway and I took the girls over to the #IncrediblessSuperDanceParty. They were both dancing in their stroller so I took them out for a bit and Mr. Incredible freaked them out, poor girls. Once Branden and Ace got back they danced for a bit then we went over to the People Mover and rode that. Ashlyn and Ace loved it but poor Everly got really nervous on it. She moved close to Ace when it got dark and he had his arm around her. I can’t even handle how sweet he is with his sisters. We then used our Fast Passes on Buzz Lightyear. I rode with Everly and Branden took Ashlyn and Ace. Branden is such a big kid, he always tries to score the highest and is super competitive. It cracks me up. Everly and I just relaxed. 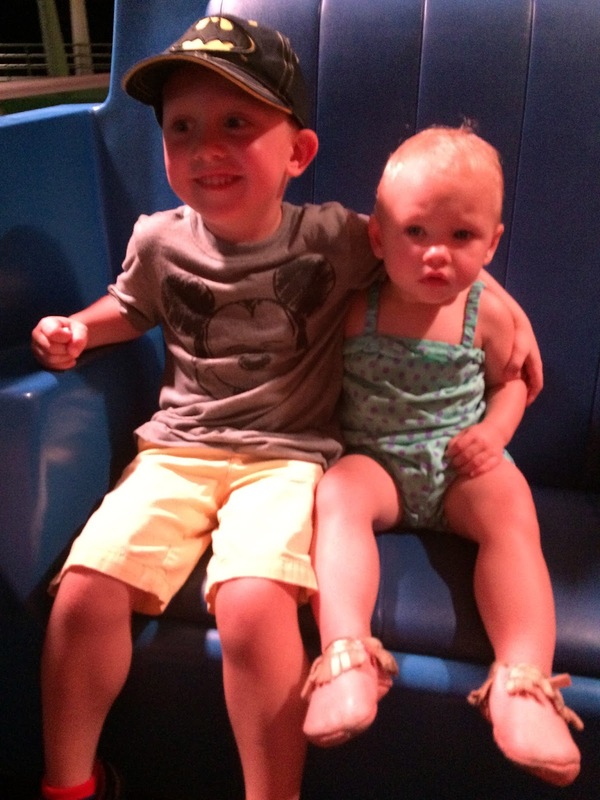 The kids, especially the girls, were getting tired so we decided to use our Baby Swaps to ride Mine Train. I really love this ride. Again, another ride we love to ride in the dark. Ace hates seeing the old witch at the end and closes his eyes but everything else he loves. After that we headed out of the park while everyone else was watching the fireworks. We got to our bus which was already pretty busy and got on the second one that came up since we wouldn’t have been able to stand with the kids. I must say there was some really sweet people who saw us struggling bit to get the kids off the bus and helped us off. It’s always a bit of a struggle with the double stroller and the girls still needing to be carried off. I can’t tell you how much I appreciate the generosity of people who offer to help. 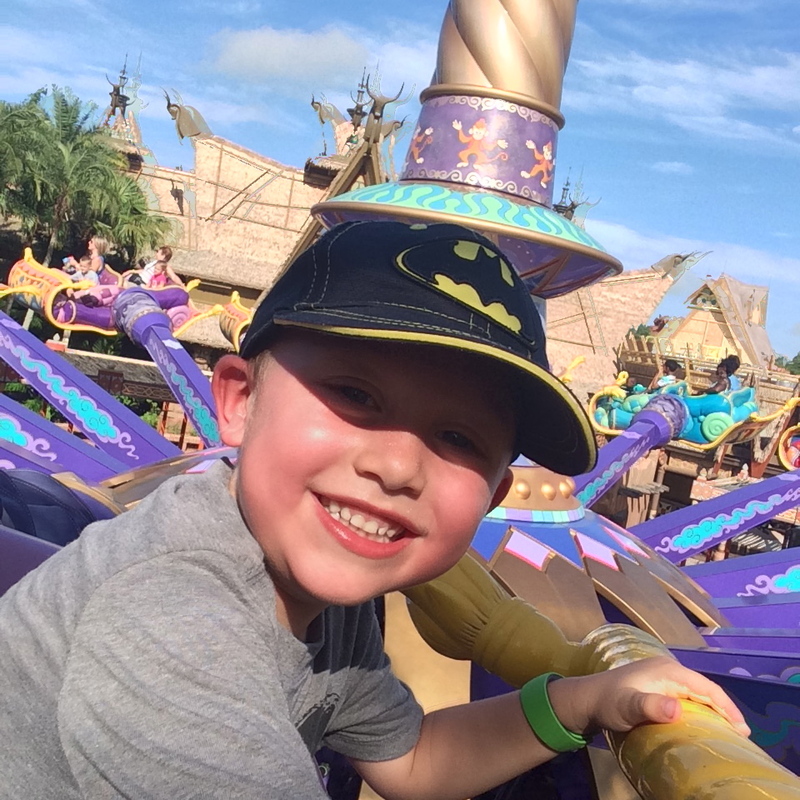 The next day we headed to Hollywood Studios!Make sure to check out all the GIVEAWAYS going on now! Next Post Maze Runner: The Scorch Trials $30 Gift Card GIVEAWAY! Sounds like a perfect day! And those Fast Passes sound like the way to go! I have never been there. 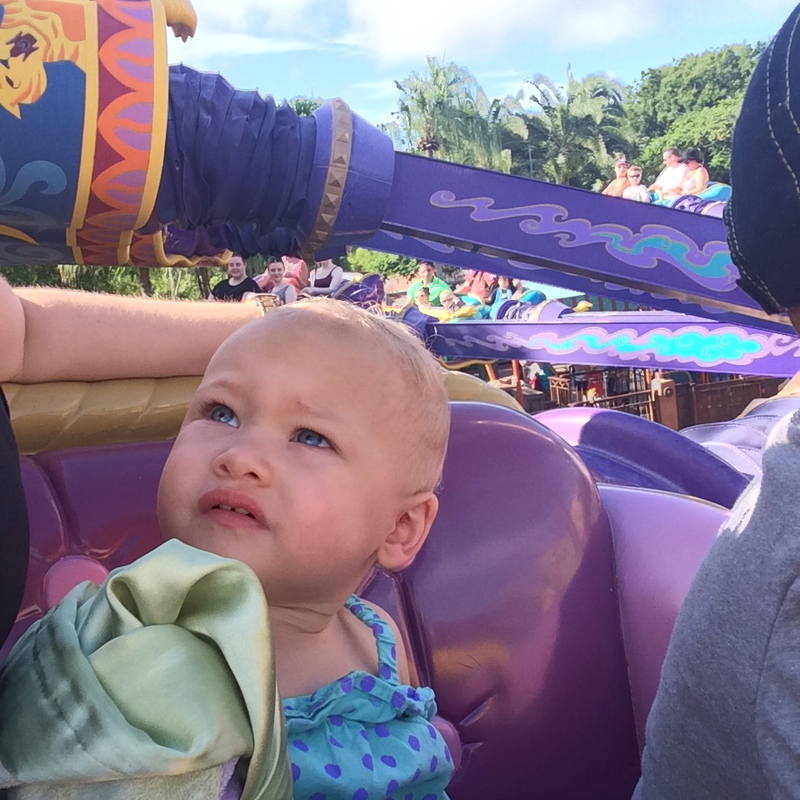 I have always wanted to take my granddaughter as she has never been on a vacation. There looks like some really awesome places to visit at Magic Kingdom. YOu got some great pics of their disney vacation, I love the matching outfits and mickey hats!